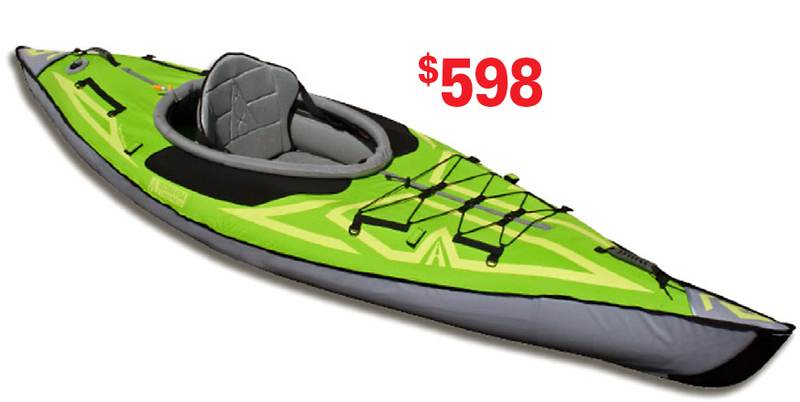 For a few hundred dollars you can purchase a new type of KAYAK that's lightweight, easy to transport, and easy to set up and paddle – no skill required! Plus, it's as safe as can be – much safer than comparable boats. 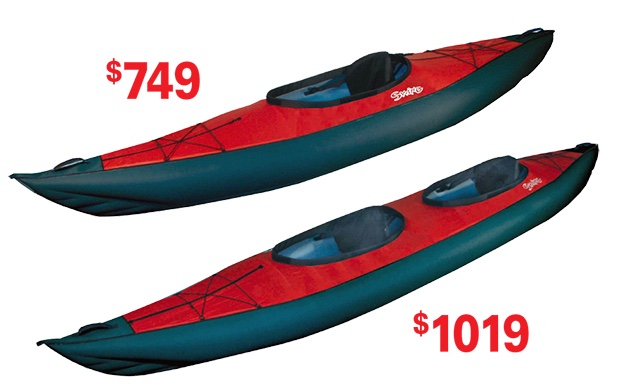 STABILITY: Due to their thick, air-filled hulls, inflatables are wider than traditional kayaks (hard shells & skin-on frame types). This gives them tremendous stability & resistance to capsizing. 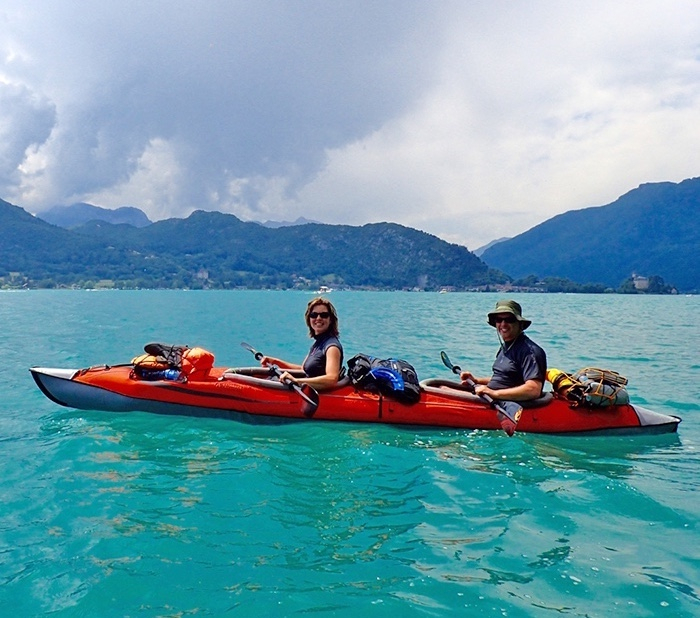 A sleek hard-shell kayak may be a bit faster, due to it’s narrower shape – but you trade a little gain in speed for a substantial loss in stability. Hard shells are much more likely to capsize in a rogue wave, dumping you into the water, with little chance of getting back into the boat. 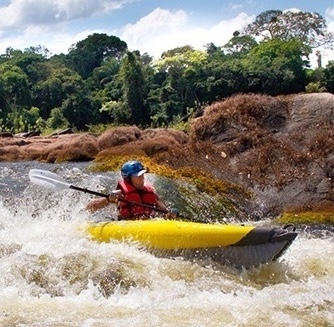 BUOYANCY: If a traditional kayak (hard shell or skin-on-frame) gets swamped, it may sink from under you. Sure, it can be outfitted with air bags and/or a watertight storage compartment, doubling as a floatation chamber. But if that chamber is open at the time of accident, it won't be of any use. And auxiliary air bags can't compare with the buoyancy of an inflatable kayak – which is one huge, multi-sectioned floatation chamber, the utmost in buoyancy. 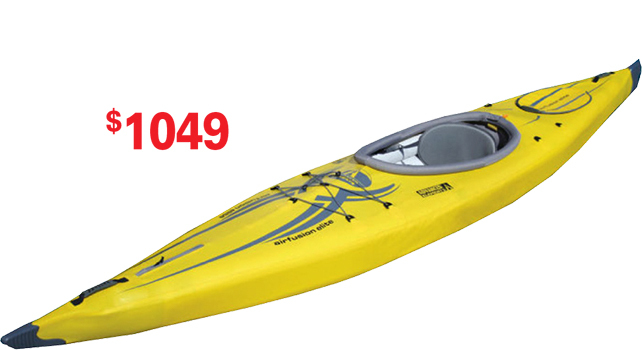 If a traditional kayak capsizes, you may find it next to impossible to climb back in and make it seaworthy again. But should you ever manage to tip over even an inflatable kayak, it's not the end of the world. Due to the boat's enormous buoyancy & stability, it's possible to climb back in and continue the journey... Just remember to always keep a spare paddle and bailing pot on board. into the trunk of your car, with room to spare. They can be checked as airline baggage, or carried onto trains & buses. Many are light enough to be carried on your back. Some even fit into your backpack. 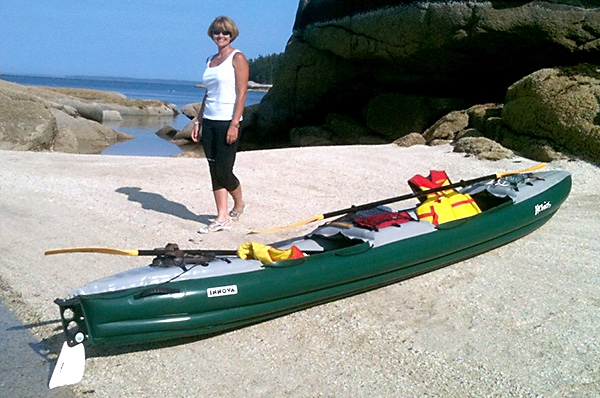 Hard-shell kayaks, by contrast, can only be carried on the roof rack of your car. Plus, you need to beware of low-overhead parkades, and not leave the boat alone – lest someone makes off with it. 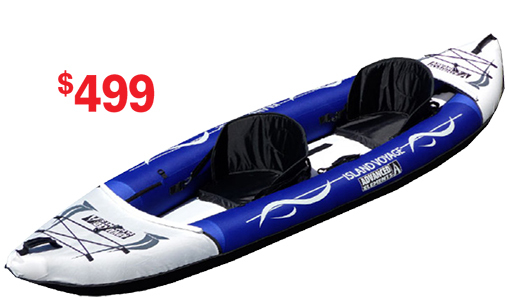 Whereas hard-shell kayaks require a garage, shed, basement, storage locker or balcony – inflatables don’t have that problem. They easily fit into any storage area, closet, cabinet, or under your bed. 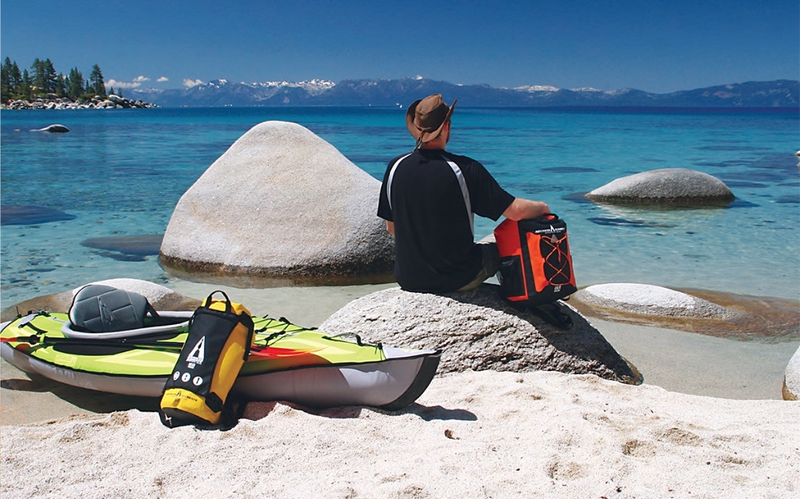 from an ultralight 4.6-pound pack raft to full-featured expedition models. Here are a few examples. See our website for the full selection. Width: 33˝ Length: 10´6˝ Weight: 25 lbs. Width: 33˝ Length: 13 ft. Weight: 31 lbs. Width: 32˝ Length 13 ft.
rivaling the performance of a hard shell. Width: 28˝ Length: 13 ft. Weight: 32 lbs. New model, with movable seats – functions as a single or double. 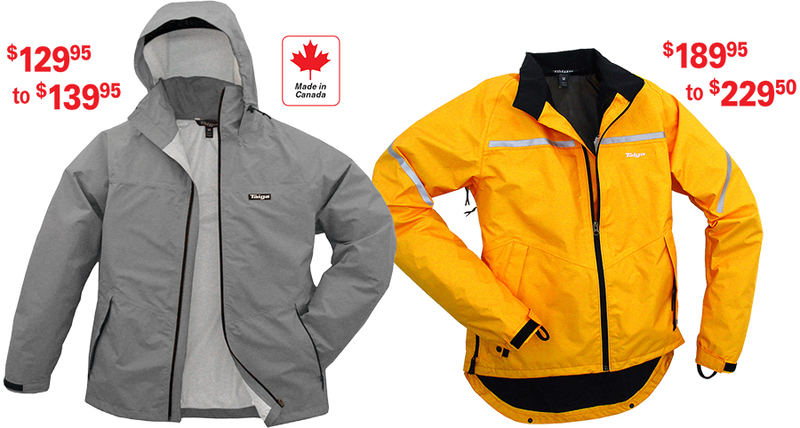 We manufacture a wide range of rain jackets (right here in Vancouver, Canada). One of our most popular styles is the RainCheck (shown below left). Lightweight and compact, it fits into its own pocket. 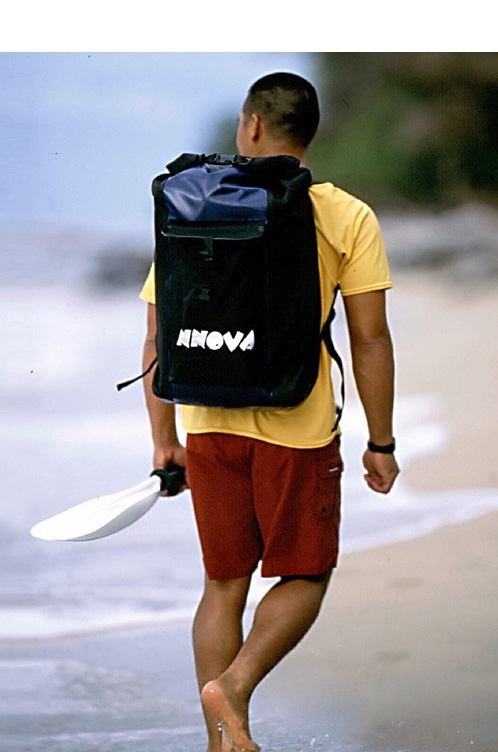 Ideal to carry in your pack (or kayak) for those occasions when the weather doesn’t turn out to be as co-operative as expected. Also check out our versatile cycling shell, the Cyclopath (shown below right). See our full selection of rain shells here. 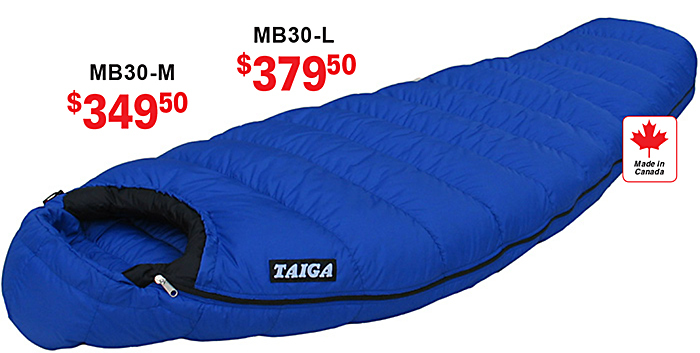 Superbly designed, and made with only the world’s best materials, TAIGA® down sleeping bags are extremely light, wonderfully warm and cozy – yet squeeze down into a compact little bundle for carrying. Waterproof/breathable shell fabric. 850+ fillpower European Goosedown. See our full selection of sleeping bags here. So, get out and enjoy the rest of spring! For product information & advice, or assistance with fitting & buying decisions: call 1-866-777-8111 (toll-free in Canada & USA).